Breakfast is one of my favorite meals. My biggest challenge when making it is the time it takes to do it right when I have a very busy day ahead. I know it isn’t a good excuse, but it still represents a challenge for me. However, when it comes to the weekend, we love to spend time making a great breakfast for everyone to enjoy. This Shirred Eggs With Ham and Tomato Sauce is one of the recipes we will make. 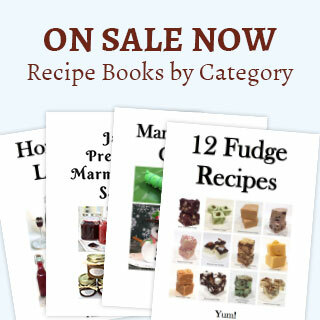 It is so pretty and oh so good to eat that it is always a huge hit. The Shirred Eggs With Ham and Tomato Sauce recipe originated from the Lodge CBSF A Skillet Full of Traditional Southern Recipes. I will admit I made a few modifications. I use small individual glazed terracotta casserole dishes or ramekin dishes that are about 5 inches across instead of the Lodge mini 5 inch cast-iron skillets called for in the original recipe. Preheat the oven to 350° F. Warm the small single serving casserole dish or ramekin in the oven. Add 1 tablespoon of butter to the bottom of the warmed dish allowing it to melt completely. Place the ham on top of the butter. Spread tomato pasta sauce evenly over the ham. Carefully break the eggs on top of the tomato sauce. Drizzle the cream over the eggs. Season with salt and pepper to taste. Place the casserole dish in the oven and bake for 12 to 15 minutes, occasionally checking for doneness. The egg whites should be set with yolks just a bit runny. Notes: Obviously you can make more than one serving at a time. Go very lightly when using the salt, the ham naturally adds salt to the dish. Check the dish about 5 minutes into the cooking time to determine how long it will need to reach the desired doneness. I used my homemade pasta sauce in this dish, but any good quality store bought tomato basil pasta sauce will work just fine. 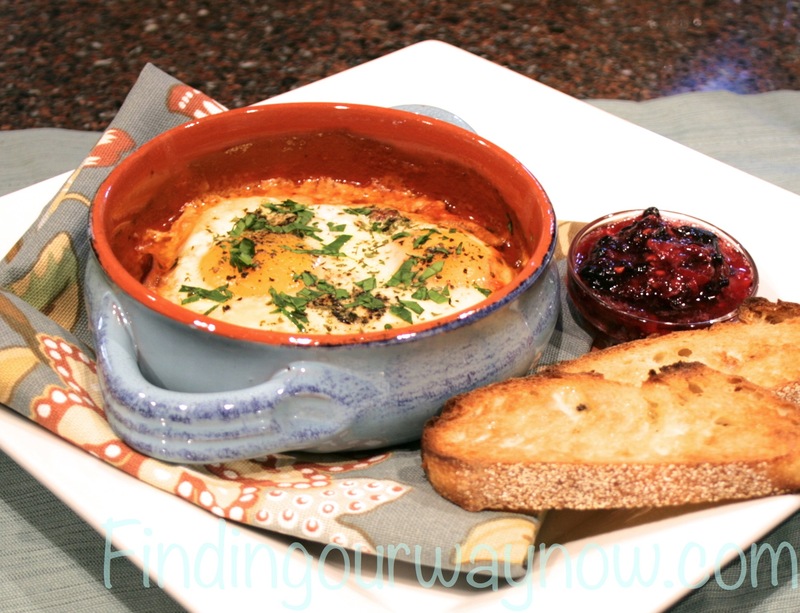 As usual, this Shirred Eggs With Ham and Tomato Sauce is an easy, delicious and a great looking breakfast dish when it comes out of the oven. Guests rave about this dish, who wouldn’t, it’s pretty and tasty, always a great combination. I usually serve it with a good rustic bread, homemade jam, juice, coffee or tea, or any beverage that will compliment the dish. How about a Mimosa to make it an extra special treat? 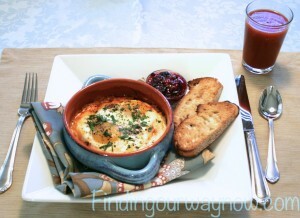 When you try this Shirred Eggs With Ham and Tomato Sauce recipe, I hope you’ll enjoy them as much as we do. If you enjoyed my “Shirred Eggs With Ham and Tomato Sauce Recipe,” check out my Spinach & Feta Cheese Frittata, Eggs In A Cup, Poached Eggs Made Simple and my awesome Homemade Granola. Enjoy.